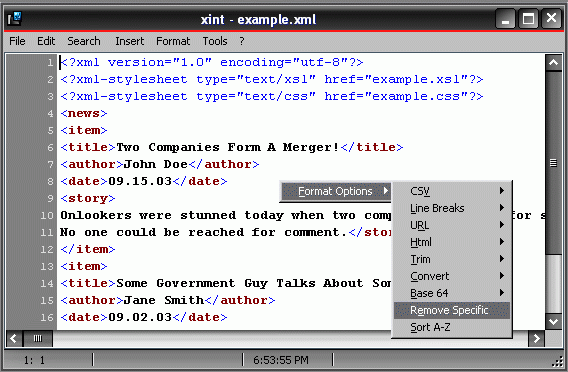 xint (pronounced "zint") is a notepad replacement tool focused on efficiency. Most of the functions are accessible via hotkeys, and extra formatting options are also available through a floating menu activated also via hotkeys or the system menu. The program can extract HTML, find-and-replace, and includes available encryption for security using Twofish. Note: main download site is offline, linking to softpedia. Writes settings to: Application folder. Only the recent files list is written to the Windows registry, so I think it can be accepted as portable. I just love this text editor to death ! It's tiny but packs a huge punch ! I agree with tommyngo : the column selected feature is the best one ! Been using it for 3 years now and still loing it !! Thank..you.. The web-address is now dedicated to bodybuilding.